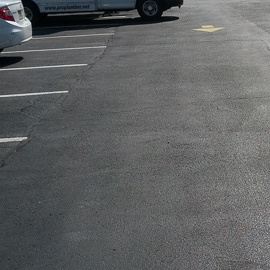 Seal coating seals blacktop driveway so you can avoid the cracking and pitting that will happen with weather and heat. Sealcoating seals small cracks and does not allow them to turn into large cracks that eventually cause you to pave the driveway again. Seal coating produces a smooth black surface which protects the your driveway from the elements but gives you an easy way to maintain your driveway. We use only the finest products and people. One of the products for sealcoating is sealmaster. Long lasting and durable it is the finest we have to offer our clients.